Every seven years, the Council on Education for Public Health (CEPH) requires that schools of public health reapply for accreditation. The process ensures that all schools comply with CEPH’s academic criteria. It also gives us an opportunity to identify ways to improve our programs and procedures. The Gillings School’s re-accreditation process is complete. We submitted the final Self-Study report (below) to CEPH in March 2017, which was followed by a site visit from CEPH in April. In June 2017, we received the draft report of the CEPH site visit team that reviewed our School, then submitted a response to their report in August. The CEPH Board of Councilors considered our Self-Study and response at their October 5-7 meeting and notified us of their accreditation decision within 30 days after the meeting. In October 2017, the CEPH Board of Councilors acted to accredit the Gillings School of Global Public Health for another seven-year term, extending to December 31, 2024. Select the image to view the Final Self-Study Report submitted to CEPH. 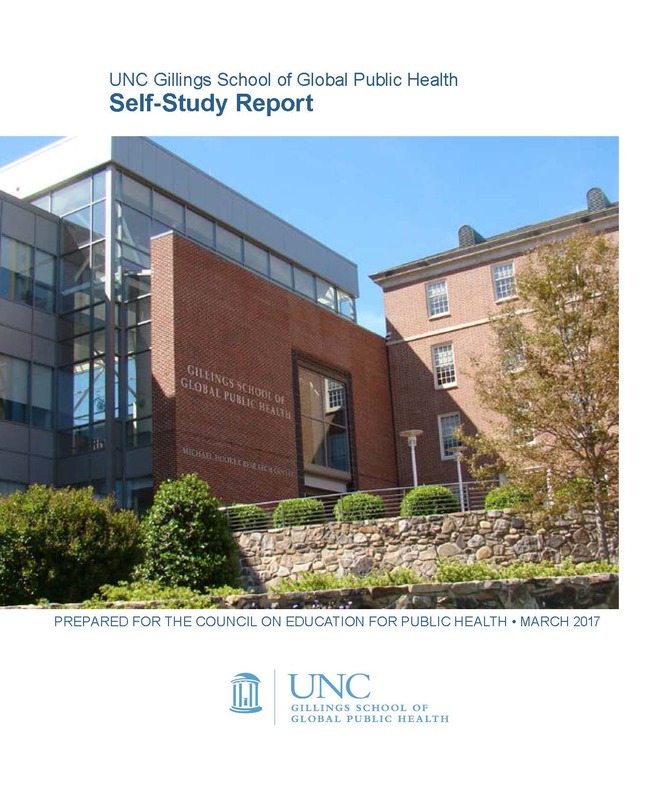 In addition to the final Gillings School Self-Study report that can be viewed by clicking the image above, the final accreditation report is available upon request by email at sph-academicaffairs@unc.edu. School accreditation and assessment processes at the UNC Gillings School of Global Public Health are managed through Academic Affairs. Accreditation is a voluntary process, initiated by the institutions being reviewed. The University is accredited by the Southern Association of Colleges and Schools. The Gillings School of Global Public Health is accredited by the Council on Education for Public Health (CEPH), an independent, private, nonprofit corporation recognized by the U.S. Department of Education. CEPH’s accreditation procedures require that the school periodically (typically every seven years) undertake a self-evaluation, submit a self-study document and host a team of qualified peer reviewers to validate the self-study during an extensive on-site visit. In addition, several departments in the school offer programs that are accredited by other, separate specialty accrediting bodies. The Gillings School was last reviewed and reaccredited by CEPH in 2010 for the maximum period of seven years. The complete 2010 self-study document (PDF) is available in a 2010 news post about our re-accreditation. Questions, concerns, or comments regarding SPH accreditation and assessment may be directed to linnan@email.unc.edu. The Council on Education for Public Health was established in 1974 by the American Public Health Association (APHA) and the Association of Schools of Public Health (ASPH)–now the Association of Schools and Programs of Public Health (ASPPH). 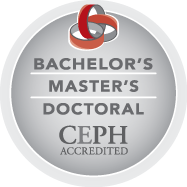 CEPH is an independent agency recognized by the U.S. Department of Education to accredit schools of public health and public health programs. The Council aims to enhance health in human populations through organized community effort by assuring professional personnel who are able to identify, prevent and solve community health problems. At the time of our reaccreditation, there were 44 fully accredited public health schools in the U.S. As of 2016, there are 59 fully accredited public health schools and 113 programs of public health in the U.S., Puerto Rico and Mexico.